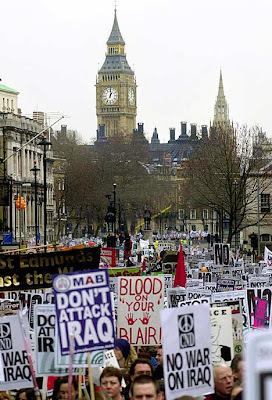 Tens of thousands of demonstrators have taken to the streets of central London to protest against the Iraq war as, [war criminal], Prime Minister Tony Blair struggles to shake-off fierce criticism of the invasion. Organisers say that between 65,000 and 75,000 protesters took to the streets for the peaceful march, which began at Russell Square, close to the British museum. Police put the figure at between 15,000 and 20,000. Protesters from around the world clutched banners and blew whistles as they marched towards Trafalgar Square, where a mass rally took place. "Militants out," one of many placards being waved by protesters said. 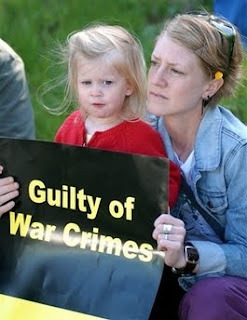 "War criminal Blair must go," said another. 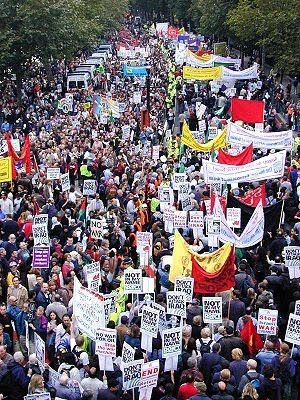 The march is the latest in a series of demonstrations organised by the 'Stop The War Coalition' before and after the US-led invasion of Iraq in March 2003. The march was arranged to coincide with the end to the three-day European Social Forum held in London. It comes also after a stormy week for Blair, who was accused in Parliament last Wednesday of misrepresenting intelligence on Iraq to make the case for war. "I am against the war and capitalism," one demonstrator, going by the name of Charkoo, said. "I want to show we are willing to fight against the war." The brother of Kenneth Bigley, the British hostage recently executed by his captors in Iraq, had urged people to turn out in force for the march. "For Ken's sake and for the sake of everyone in Iraq I ask you to make your feelings known to our Government, to protest and to join the demonstration," Paul Bigley said. The protest comes just days after Mr Blair apologised to Parliament for flawed intelligence on Iraq.